German duo Centrozoon featuring Markus Reuter (on Warr Guitar) and Bernhard Wostheinrich (on Synthesisers) have created a sound world that is both intriguing and captivating. There are few signposts in the way of rhythms or solos to be found on the album. Instead each track is a collaboration of equals, where Reuter and Wostheinrich meld their respective sonic palettes to create a work of texture, and poise. In this quest for balance, the duo display an almost painterly concern for the use of space, tone and colour. Each aspect of the album is assiduously compiled and compacted, with luminous motifs and phrases sweeping up through the rich layers and fading away. With so many amorphous and half-glimpsed events, its this use of ambiguity which almost paradoxically lends Blast its strength, ensuring that the listener remains engaged and part of the overall process. Don't be tempted to think this is tame ambient wallpaper. It's not. There is a sureness of touch with ensures the music resonates vibrantly throughout each of the four tracks. 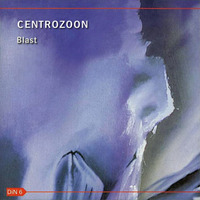 Blast is the duos first album for DiN and it contains a warm, passionate music suffused with a pulsating inner light. A work of remarkable maturing clarity from two fine young players.